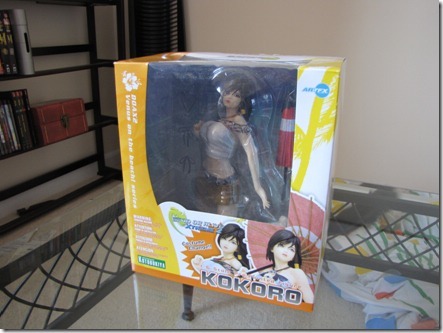 Kokoro unboxing – How Do You Figure? Special thanks given to ravnel at DannyChoo.com for giving me the opportunity to own this figure. I got out of work a little early today so I could enjoy the sunshine. When I got home, I found a nice surprise in my mailbox. The Kokoro figure that I’d bought from another user on DannyChoo had arrived! Each unboxing is a special event, and this was no different. Since she was still new and unopened, she still had that new figure smell. Once I’d removed her, it was time to take some photos. She comes with several options, so there was room for experimenting! 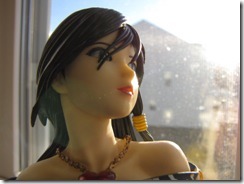 At first, I had her positioned in front of a window to get the natural light effects. The cast off pieces are pretty easy to remove. 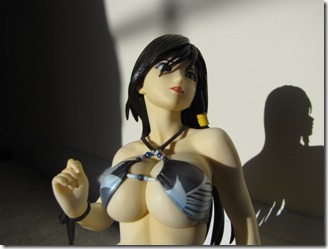 She comes with extra ribbons to complete the swimsuit look, as well as a strap for the top. 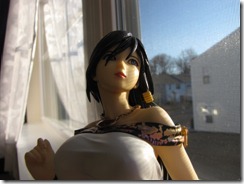 Additionally, she comes with an umbrella and a base. All of the parts are extremely detailed and very well made. Then I realized there was a far better place in the room… the wall opposite of the window. In order to get the best light, I had to act fast, as the sun was setting. For more photos, click through to the album. She even had a special guest join her for this occasion! 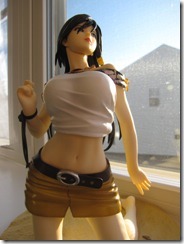 Very nice figures, althought her chest seems a lot bigger than in the game for some reason.